Email this recipe to a Friend! Just in time for the holidays we have a really yummy mix it up kind of recipe for you. 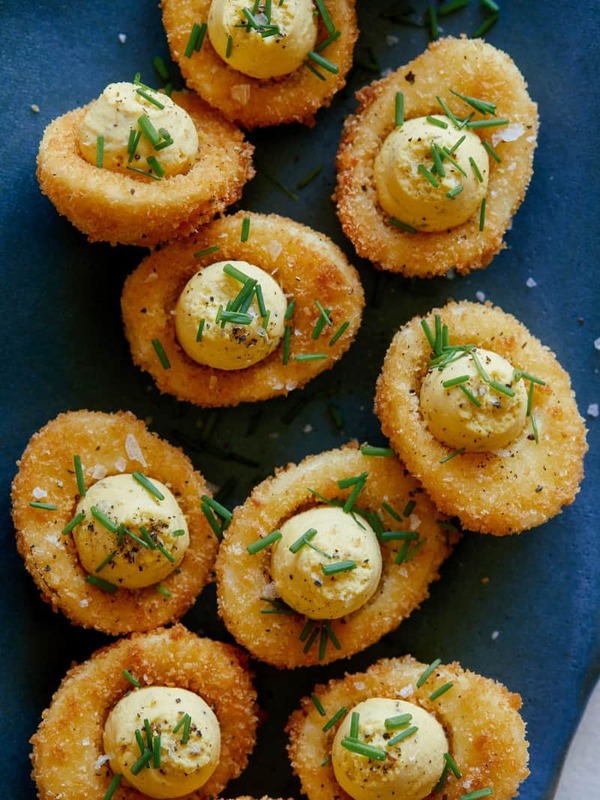 If you are in charge of bringing deviled eggs – maybe try our fried deviled egg recipe. 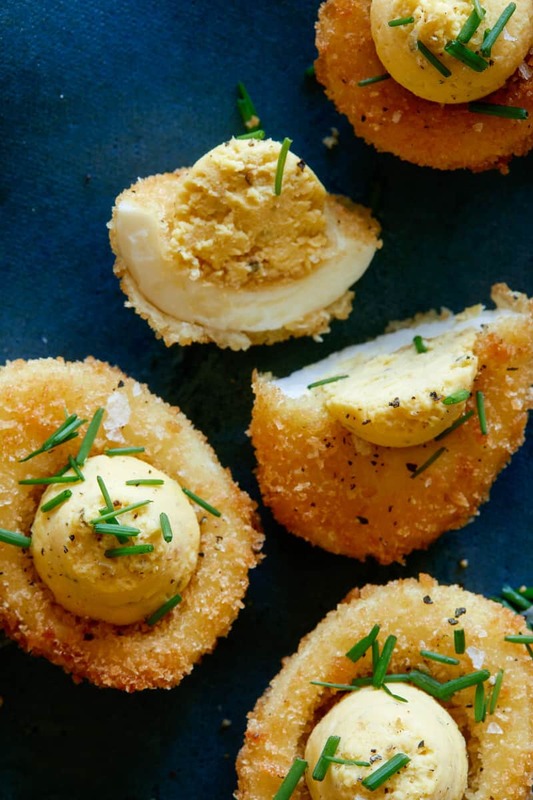 The crunch of the egg is a really nice change to your typical deviled egg. 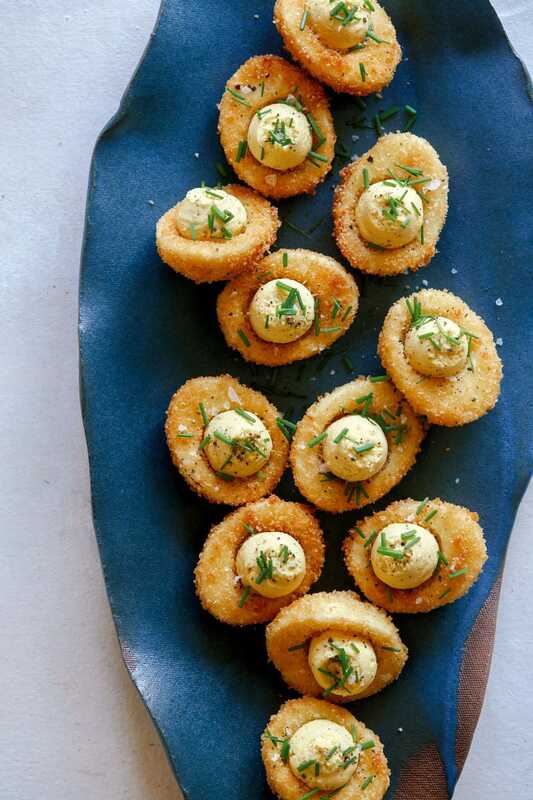 Plus, everyone likes fried things so you’re kinda guaranteed it will be a hit. I am a really big fan of deviled eggs, and these do not make me wish I had the regular kind. Anyway – you should try them! Enjoy! 1. Carefully scoop egg yolks from the egg whites, into a mixing bowl and set whites aside. 2. Add mayonnaise, relish and mustard to yolks and lightly season with salt and pepper. 3. Mash together until smooth and creamy. Adjust seasonings, cover with plastic wrap and set aside. 4. Set up an assembly line with the egg whites, flour in a shallow baking dish, eggs in a mixing bowl, and the panko and crushed crackers mixed together in another shallow baking dish. 5. Dredge egg whites into the flour, eggs and finally the panko-cracker mixture, shaking off any excess after each addition. Repeat until all the egg whites have been breaded. 6. Fill a tall pot with 2 inches oil and preheat to 350˚F. 7. Carefully add egg whites to the pot, a few at a time, and fry on each side for 2 to 3 minutes or until golden brown. Drain fried whites onto a paper towel and lightly season with salt and pepper. Transfer whites to a cooling rack (to prevent them from getting soggy) and repeat until all have been fried. 8. Scoop about 1-2 tablespoons of the yolk mixture into each well(or scoop mixture into a piping bag and pipe into the wells). 9. Finish each egg with a sprinkle of chives and serve. Wow! These look gooood… just had to show everyone in my office and they agreed. OMG, YAY! I had a version of these fried deviled eggs at EAT in Vegas and they were delicious. Can’t wait to try them for myself. Wow, these are beautiful! Alas, I always have trouble getting my hardboiled eggs out of their shells whole – any tips? Boil the water first-then add your eggs (I use a spoon to gently lower them in the boiling water). Boil for 3-4 mins and remove from heat. Cover, and let sit for about 15 mins. Drain and run cold water over until you feel they are cool enough. The shells will peel right off! Load eggs and water into pot. Bring to boil for5 minutes. Immediately drain water. Add cold water and ice and let sit till cool. Shells come off easily. I can do like 12 of them in 3 minutes. use older eggs, or use a table spoon to tap the rounded bottom, and sides of the egg, peal the bottom shell where the air bubble is, then slide wet spoon in between shell and egg, then work spoon around the egg being careful not ‘dig too deep’, after a few tries you can become quite proficient. I usually run either cold or warm water over the process if the eggs are a little sticky(new eggs), but it’s not usually necessary. Hope you like the tip. To peal hard boiled egg, put in a glass with about an inch of cold water place hand over the glass and shake end to end hard for about ten seconds, shell will almost fall off. Made these for Christmas morning and it was a big hit with the family! They were delicious. However, my only recommendation is that while making these, we had an overwhelming excess of flour and breadcrumb/cracker mix leftover. I suggest using less of those ingredients. For the number of eggs, you probably only need about 3/4-1cup of flour and 1 cup combined of breadcrumbs and crackers. That way you’re not wasting and throwing away the rest. Question…are these to be served warm or cold? If warm, how would you re heat them? Asking because I would need to make these 1 day prior to serving at Easter. Thx! I would say you could make the filling and bread the egg whites the night before. You’d had to fry them the day of serving.